The tour was excellent. The service provided by Wilson and the driver went above my expectations. Wilson arrived at my hotel on time and waited for me in the lobby. He provided me with all necessary information at each stage of the tour and answered my numerous questions. He showed a lot of flexibility and complied with all of my requests. The tour was well organised, with the car available at a moment's notice, and no or very little time spent on queuing at each attraction. Our guide was Brian, and he was great. 5 friends and I were staying in Shanghai and later Beijing. I had been to China several years ago, and I felt my friends should see a village in China in addition to big cities. Brian took us to Zhujiajiao, a 700 year old village. 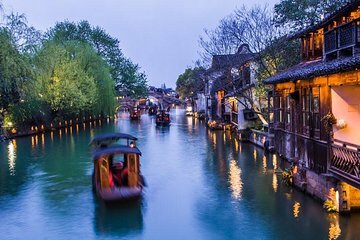 It is called the "Venice of China" because of the canals. We had lunch in the village. Thereafter, Brian took us to Yu Garden, the Shanghai Tower and the Bund. This was a private tour with just my group. My friends and I loved this tour. We booked this tour as we had limited time in Shanghai and wanted to squeeze in as much as possible. We were met at our hotel by the wonderful Daisy and made to feel like VIPs for the entire day. Daisy adapted the iteneray to suit our needs and kept us expertly informed at each stop. We couldn’t have asked for a warmer, friendlier guide and driver. The tour itself was a perfect combination of the old (Watertown) and the new (Shanghai tower) with culinary delights thrown in for good measure (lunch was amazing). If you have limited time in Shanghai, book this tour for a sure fire way of sampling the best that this amazing city has to offer. My tour guide Wilson was very knowledgeable and explained the meanings behind the cultural symbols that we saw. He customized the tour for me. I really enjoyed the gardens in the water town, the Shanghai tower, and the tea tasting. My only complaint would be the amount of traffic that we had to sit through to get to the water town, but not the company’s fault. Thank you for a great day! Today I enjoyed the company of Lan Hong (“Berlin”) as a tour guide for the day. She was educational, humorous, entertaining and, basically, all around a wonderful host and very proud of her country! She shared stories about buildings and areas, and helped us barter for goods. I will recommend your services to others and I believe Lan Hong is a true asset of your company. Wilson was our tour guide, he was very friendly and easy to have good communication with, he was very knowledgeable about Zhujiajiao, the Jade Buddha Temple, we had an amazing local lunch, afternoon Tea tasting, and had an amazing experience in Shanghai Tower. I feel the private tour was a highlight and my favorite day of our trip while in Shanghai. Wilson has been a great host in Shanghai。 His knowledge and friendliness made our day so enjoyable and has been the highlight of or China trip. I would recommend the tour and Wilson for anyone traveling to Shanghai. 5 stars all the way. Daisy was amazing. She has so much knowledge of Shanghai, spoke wonderful English and has the best personality. We would definitely request Daisy again for another tour and suggest her and Viator to everyone. I had a happy tour with my tour guide Snow. She gave me a lot of information about everywhere. Snow is very patient and take a lot of photos for me. She also help me to do shopping. We visited a lot of nice places. The water Village is so pretty. The restaurant we eat in the water village was very good. I will highly recommend this tour.